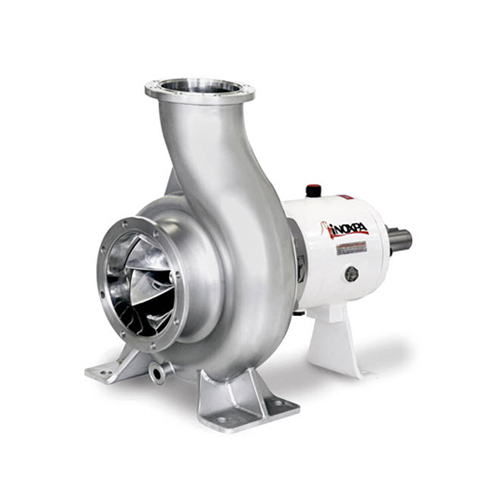 The DIN-FOOD pump is a hygienic high capacity centrifugal pump (up to 1000 m³/h) designed to cater for an unfulfilled need in the food-processing and chemical and pharmaceutical industries. 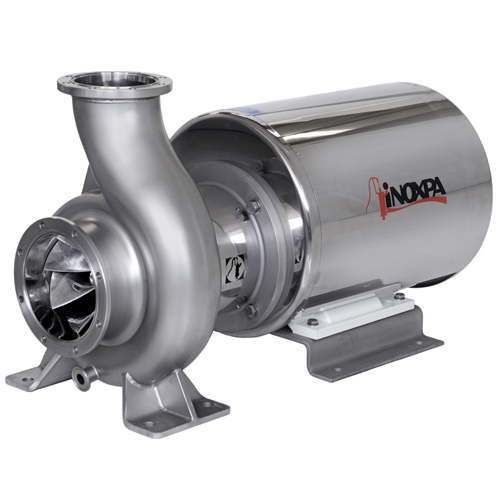 The applications of the high-flow centrifugal pump include processes in the brewing, dairy and beverage industries in general, as well as in ultra-filtering processes. It can also be used in the textile industry and in some specific processes in the chemical, cosmetics and pharmaceutical industries. 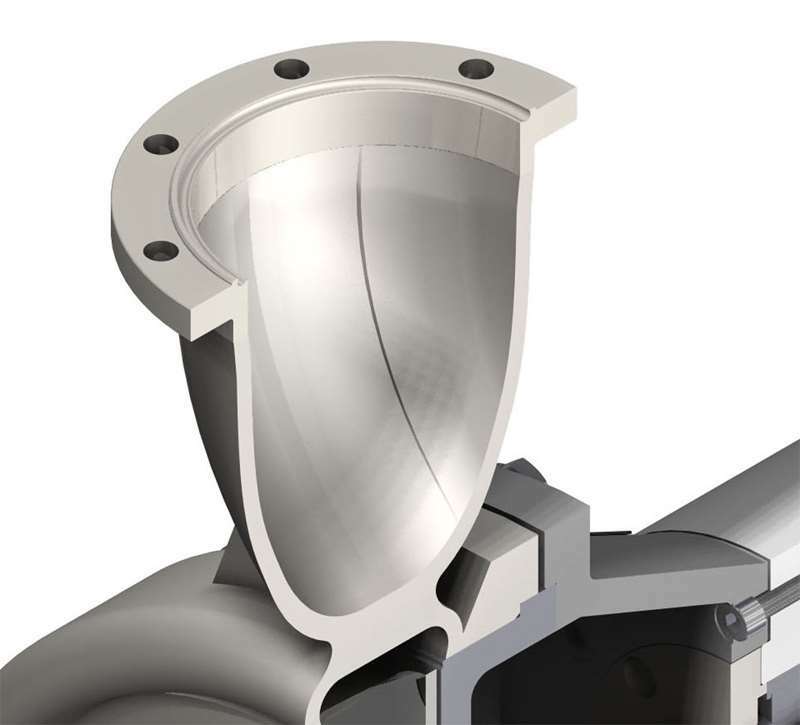 Housed inside the casing, the impeller rotates in conjunction with the pump shaft. 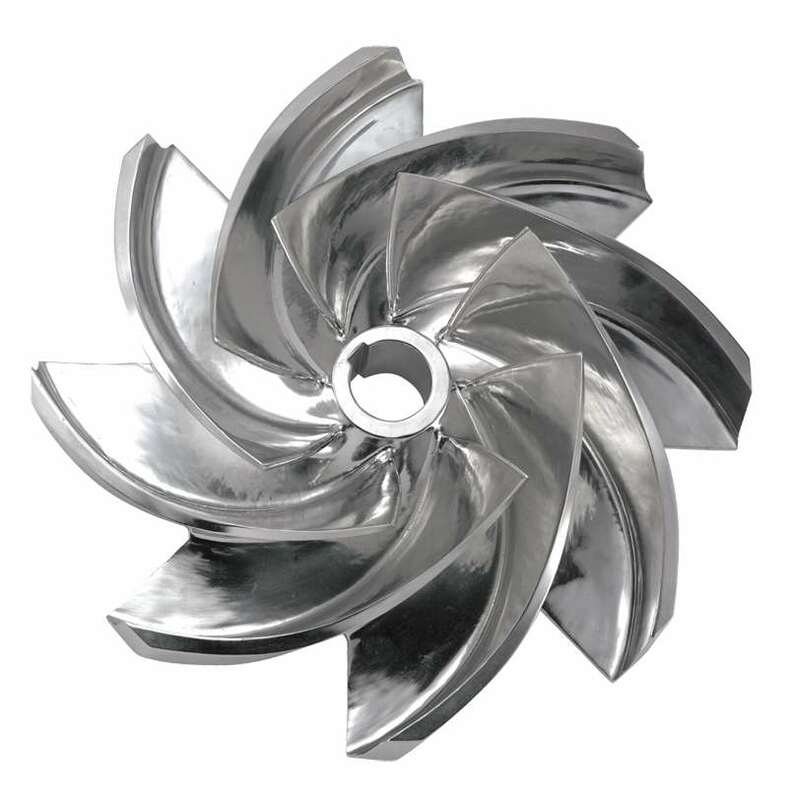 With this arrangement, the impeller blades convey energy to the fluid in the form of kinetic energy and pressure energy. This pump is not reversible by a simple reversal of the direction of rotation. The direction of rotation is clockwise when the pump is viewed from the rear side of the motor. Casing with volute manufactured with 8 mm cold-formed plate. Aseptic flanges according to DIN 11864-2. 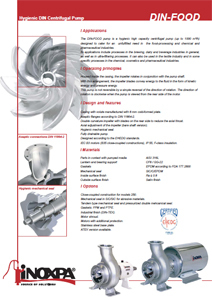 Double curvature impeller with blades on the rear side to reduce the axial thrust. Axial adjustment of the impeller (bare shaft version). 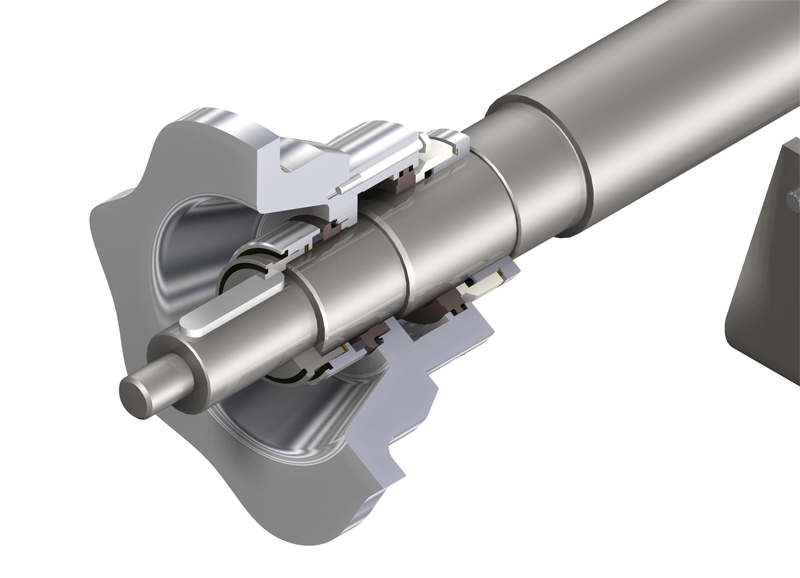 Hygienic mechanical seal. Designed according to the EHEDG standards. Tandem type mechanical seal and pressurized double mehcanical seal. Summary La pompe DIN-FOOD est une pompe centrifuge hygiénique à grand débit (jusqu'à 1000 m³/h) conçue pour couvrir un besoin pas couvert jusqu'à présent dans l'industrie alimentaire et chimico-pharmaceutique. Summary La pompa DIN-FOOD è una pompa centrifuga igienica di grande portata (fino a 1000 m³/h) disegnata per ricoprire una necessità non coperta fino a questo momento nell'industria alimentare e chimico-farmaceutica. Summary Die DIN-FOOD ist eine Hygiene-Kreiselpumpe mit großer Durchflussmenge (bis 1000 m³/h), die entwickelt wurde, um einem bisher in Chemie-, Pharma- und Lebensmittelindustrie nicht abgedeckten Bedarf nachzukommen. Design nach EHEDG-Anforderungen. Summary Насос DIN-FOOD представляет собой гигиеничный высокопроизводительный центробежный насос (до 1000 м³/ч), спроектированный в ответ на невосполненные потребности пищевой, химической и фармацевтической промышленности. Summary DIN-Food 系列离心泵是卫生级标准的离心泵，属于大流量的离心泵（最大流 量可到1000 m³/h). Summary Este manual contiene información sobre la recepción, instalación, operación, montaje, desmontaje y mantenimiento para la bomba DIN-FOOD. 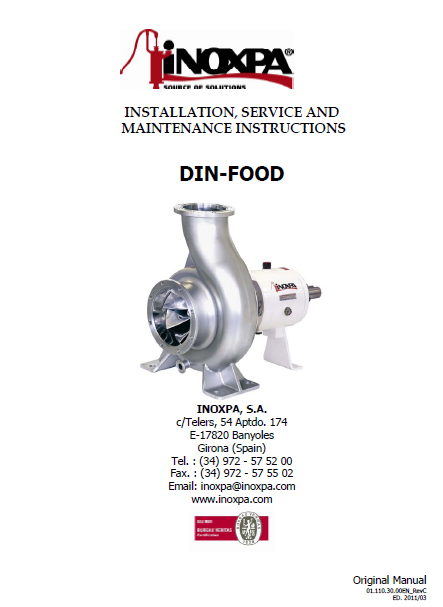 Summary This manual contains information about the receipt, installation, operation, assembly, disassembly and maintenance of the DINFOOD pump. Summary Ce manuel contient des informations concernant la réception, l’installation, le fonctionnement, le montage, le démontage et l’entretien de la pompe DIN-FOOD. Summary Die vorliegende Betriebsanleitung enthält Angaben zur Abnahme, Installation, Betrieb, Aufbau, Abbau und Wartung der Pumpe DIN-FOOD. Summary Данное руководство содержит информацию о приемке, установке, работе, монтаже, демонтаже и техническом обслуживании насоса DIN-FOOD.